Breakfasts, lunches or after-school snacks, GG Lau makes food fun for her two girls and shares her ideas, recipes and photographs here. GG uses ingredients like fresh fruit, yogurt, seaweed, cheese and bread – anything she has handy at home – to create interesting pictures. 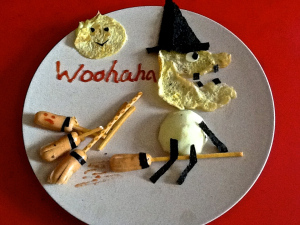 Her kids love her food art, and since she began fixing them these fun snacks, they are a lot more excited about mealtimes. Sometimes, they even request a favourite scene or character. 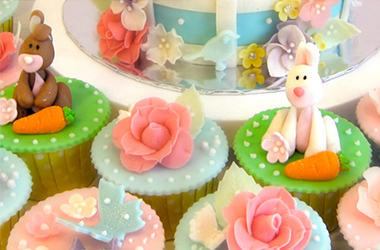 Isn’t art more fun when it can be eaten?! 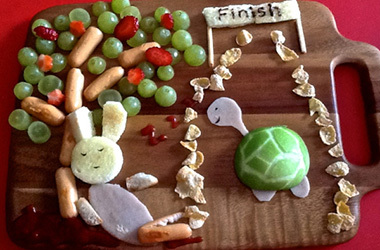 To get her two girls to eat more healthily, she trawls the Internet for easy-to-make food art ideas. Even her most simple I-have-no-time-today creations can inspire picky eaters who just won’t look at fruit and vegetables. Try out some of GG’s adaptations. The only tool you need is a sharp knife. 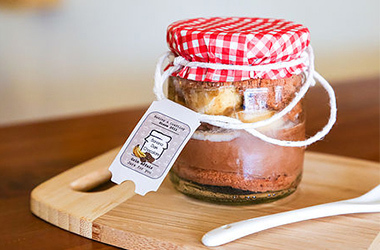 And even if it doesn’t turn out perfect, the idea is to have fun with food … so go ahead, get creative ! 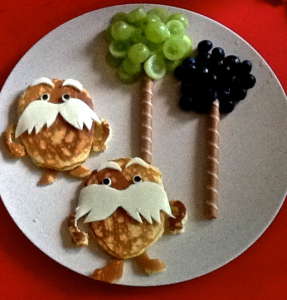 The Lorax is made out of pancakes. Make your kids’ favourite pancake batter and drop scoops into a hot pan with a spoon, forming rough shapes for the hands, legs and body. Use sliced cheese to cut out the features of the Lorax. The eyes can be created with either seaweed or raisins. The Truffula Trees are made with long straw-shaped wafers, topped with sliced green grapes and blueberries. Handy hint: If it is difficult to shape the Lorax whilst frying the pancake, make a regular circular pancake and cut out the shape. It’s okay if it is not perfect, as long as it’s roughly the right shape. 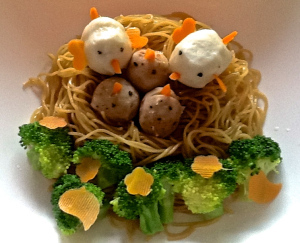 Make a nest from cooked noodles or pasta. Use cooked squid balls (like GG did) for the Dad and Mum birds and chicken meatballs for the baby birds. Shape the wings and beaks from thinly cut carrot strips. Use black sesame seeds for the eyes. Steam and toss vegetables of your choice in butter, and arrange around the nest. Handy hint: The birds can be made from any other ball-shaped food, like croquettes, or even melon balls – use a melon ball scooper. Shape plain, cooked rice into a ball and arrange on a plate. 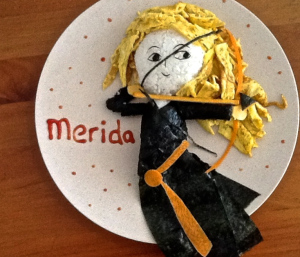 Fashion a sausage-like roll from the rice, and attach to the ball to make Merida’s face and upper body. Cut out sheets of seaweed to form her dress, using rolled seaweed sheets for her arms. Thinly sliced carrots make up her belt and bow. The bow-string is made out of a strip of seaweed, the arrow from a pretzel-stick and the arrowhead from seaweed cut into a triangle. Two thin sheets of egg omelet, cut into strips and arranged around her face become Merida’s hair. Sheets of seaweed, cut into various shapes form the features of her face. 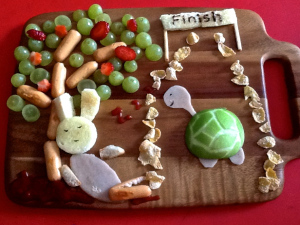 Create a scene from a favourite tale, like that of the race from The Hare and Tortoise. Cut out the rabbit’s face and ears from a slice of buttered bread. Cut an oval slice from ham to form the body and use sliced, cooked sausages for its arms and legs. Lay cooked mini sausages in a vertical row to form the trunk and branches of the tree the rabbit sleeps under. Top with sliced fruit, like green grapes and strawberries. 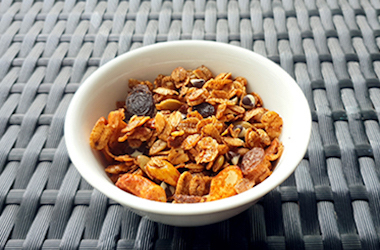 Lay a trail of cornflakes to look like the race track. Cut a small rectangle from the buttered bread and pipe the word ‘Finish’ with Nutella, and use pretzel sticks to create poles of the banner at the finish line. Cut out the winning tortoise’s face and feet from a slice of ham and score the skin of a circular piece of green/red apple with a criss-cross pattern to form its shell. Handy hint: Use a toothpick to cut out the shapes from the ham. 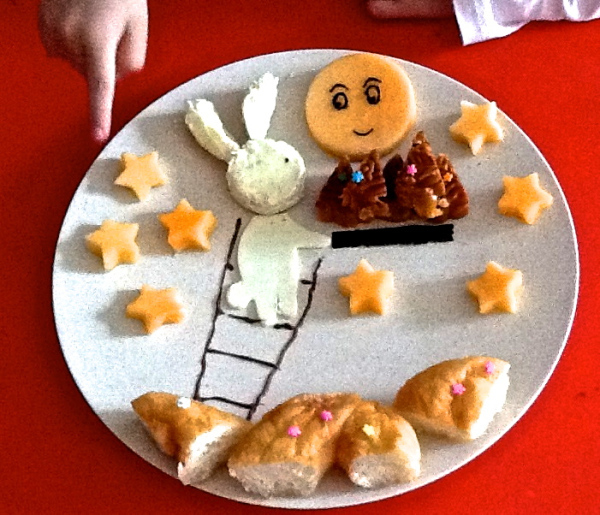 Make your food art seasonal, like the Flying Witch for Halloween, or the Rabbit Climbing to the Moon for the Mid-Autumn Festival. Fry an egg, cooking both sides. Cut out a round moon and the witch’s profile with a circular cookie cutter. Peel an apple and cut a circular piece to form the witch’s body. Use a sheet of seaweed to cut out the shapes of her arms, legs, eyeball, teeth and hat. A small round piece of cheese forms the witch’s eye. Use a biscuit / cheese straw / pretzel stick to form the broomstick, and tail it with a cooked mini sausage. You can add other things to the picture, like mini sausages, fruit or piped ketchup. Cut out the rabbit’s face and ears from a slice of buttered bread. Cut an oval from a slice of cheese for the body. Pipe a ladder out of Nutella, to look like the rabbit is standing on it. Use circular and star shaped cookie cutters to cut out the moon and stars. Create the moon’s features from shapes cut from a sheet of seaweed. Chop up a moon-cake into triangles and lay under the moon to look like little mountains. Break up a sugar doughnut (or similar) and lay it at the bottom of the ladder. Dot with star-shaped sprinkles. Basically, kids, food and mealtimes (and other times) need not be stressful at all … some imagination, a bit of patience and a lot of good cheer will work wonders ! 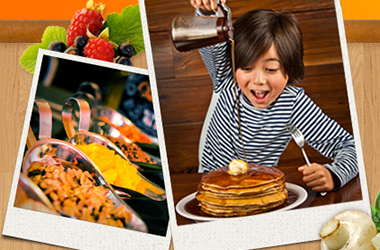 Singaporeforkids endorses the good fun and good times that make up a happy, healthy family. Check us out for more ideas with what to do with kids.